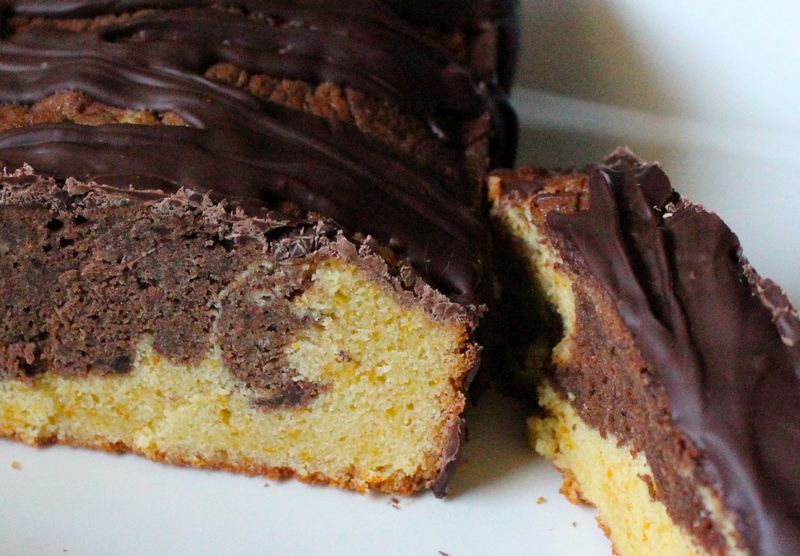 Happiness Project #32: Chocolate Orange Pound Cake! Mmmmmm! Orange and chocolate. Since nearly every HP dessert I’ve done since first creating this blog nearly 2 years ago has mostly involved chocolate, I thought it was high time to throw some citrus into the mix. And since I’ve never experimented with oranges before (for shame, right? ), I ended up whipping up a very traditional Chocolate Orange Pound Cake recipe. Traditional because I did absolutely nothing to change the actual recipe, though I might add some chocolate chips into the mix the next around. And WOW, was this one of this easiest yet quickest cakes I’ve ever done! One, which not only smelled DIVINE while puffing up in my oven but tasted even better the second day out! Need to whip up something yummy that everyone will like but don’t have much time to do so? Then this, my friends, is the perfect cake for you! Preheat your oven to 350F. Butter and lightly flour 1 small loaf pan. Or butter up a muffin pan for yummy, breakfast treats instead! Have kids, anyone? In a bowl on your stand mixer, cream together the butter and granulated sugar until smooth and creamy. Add in the eggs, one at a time, until well mixed, followed by slowly sifting in the all-purpose flour. Once blended, divide the mixture equally between two small bowls. In one bowl, add in the milk & cocoa powder and combine together. In the second bowl, beat in the orange zest until well mixed. Spoon the mixture into the loaf pan, taking large alternate spoonfuls from each bowl. Using a fork, gently swirl the mixture together to create a marbled effect. Do not STIR the two batters together though or they will blend and you will lose the marbled effect. Bake for up to 45 minutes until golden brown on the edges and top. With a toothpick, check to make sure that the cake is fully baked through in the center. Let cool on a wire rack for a good 30 minutes before loosening the cakes edges with the flat side of a butter knife and removing from the pan. « Happiness Project #31: Merry Christmas Red Velvet Whoopie Pies!